As I look to unplug a bit during the first week of summer vacation, I am continuing to repost my top posts from last year. Below is #8 from last August. 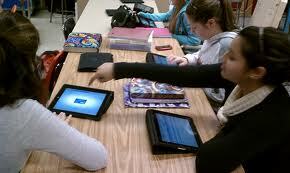 The most common question we get regarding our 1:1 initiative (with (iPads) is – What apps do you recommend? While I understand that it seems like a logical question, I hate it. The reason for my disdain is that the focus of educators should be on outcomes first and not on devices or apps. Before we can answer the app question, we need to have a bit more information about what the goals are for the class and how the teacher would like to facilitate the lesson (i.e. will students work independently or collaboratively). So when it comes to the iPad, there are over 225,000 apps in the App Store. I am not going to even get into the discussion that we should stay away from becoming app-dependent and focus on digital resources that are free and will work on an platform. (I’ll leave that for a future post). Instead, we’ll stay on the topic of not using technology for technology-sake. We need to be careful with all of the excitement over bringing shiny new devices into our schools that we do not put gadgets before goals. It’s true- I do. Let’s sort this out, though. I like iPads a lot. They’re not the only decent device anymore, but they’re very good, and they’re not too expensive. Blah blah blah. I love that my students have a device with them all the time. I can’t imagine teaching without it, at this point. I’d cry (and debate a change in location/profession) if they were taken away or banned. All that said, people keep asking me “how I use the iPads in the classroom.” And the answer- the honest truth in the answer– is that I mostly ignore them. The device isn’t the point. I’d never try to shoehorn a device (or tech of any sort) into a lesson. That’s all sorts of backwards. The tech lubricates the lesson. It allows things that weren’t possible before. It allows things to happen quickly. It smoothes the road. So when I design lessons, I just factor in the myriad things that students can now do. It’s like a bunch more colors got added to my pallet and the pictures I’m painting are that much more vivid. I simply factor into the plan that research/writing/notes/web work can all happen on the fly. That collaboration on an essay is not only possible, but is normal. That data isn’t lost. That the classroom can extend far beyond the 43 minutes I have. But I don’t know that I’ve ever told students to open a specific app. I know I’ve never demanded that they have an app. I know that I don’t really care about the apps that they have- just that they have apps that work for them to accomplish the tasks that I need them to do. I know what I’m talking about here is specific to High School. That’s what I do, and that’s likely to remain the focus here. I think this point is relative to all levels and I think it’s something we need to reiterate.